Are You Concerned About Idle Time? One of FleetWatcher’s™ functions is tracking idle time. With our patented idle tracking software we can help you see how much your equipment is working while it’s running. Many customers have upwards of 50% idle time when they adopt our GPS fleet management system. That means half the time the engine is on, that piece of equipment isn’t working towards their job’s goals. What FleetWatcher can do to help you is track your idle time. Knowledge is the key here, you can see which pieces of equipment are running and for how long it’s working for you. Productivity Reports are available daily and let you track Idle Time vs. Productive Time by worksite, equipment type, and by any period of time. 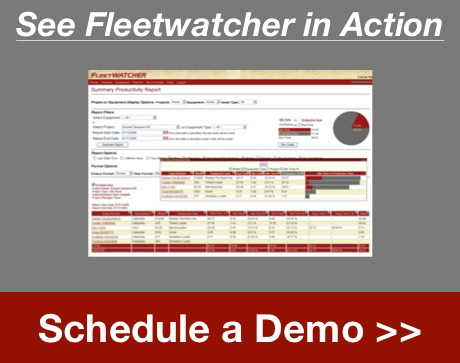 Click the image to see how FleetWatcher can reduce your idle time. Idling a little here and there isn’t a big deal right? According to fuel wasted, service (PM repair/Maintenance), and ownership costs we found the average Idle Time cost per hour to be $34. Based on thousands of cases, FleetWatcher has reduced idle by more than an hour per day per piece of equipment. That means that an hour of idle per day costs over $6000 per year per piece of equipment. 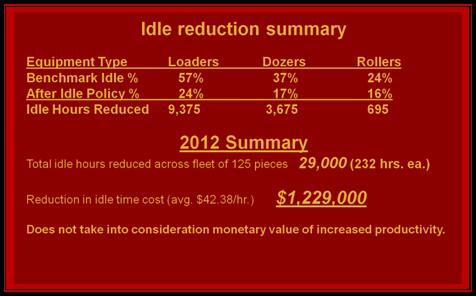 In 2012, in a fleet of 125, FleetWatcher helped reduce a company’s idle time by 29,000 hours resulting in a savings over $1.2 million dollars. These savings were only for savings from idle time reduction which doesn’t include value of increased productivity. In 2013 we saw similar results. We have seen FleetWatcher pay for itself within the first 90 days of use through the reduction in idle time alone, and, at that point, we are just getting started. For example, if a piece of equipment has sat idle for 10 minutes an alert can be sent out to the foreman of that work site. He can then check on the piece of equipment and either get it shut off or working. These alerts can help you reduce idle time across your fleet and save you money.